In what is being described as the speediest signing of a bill passed by Connecticut’s legislature, Gov. Dannel Malloy outlawed the practice of trying to change the sexual orientation of young people from gay, lesbian, bisexual to straight. The law also applies to all efforts to force transgender youth to not identify according to their authentic gender identity. “This is supported by the science,” Gov. 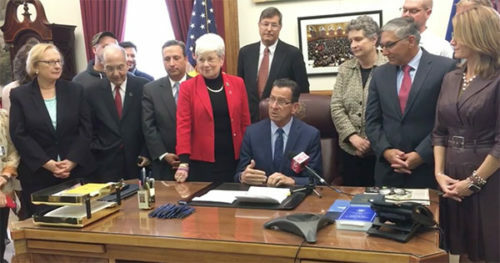 Malloy told legislators and advocates gathered around his desk before signing the bill into law Wednesday, mere minutes after the state senate passed it, unanimously. It’s supported by our cultural awakening and awareness that we are a society of many different players and very different folks, and we shouldn’t try to make everyone just like us. We should recognize that some people are simply not us, but that doesn’t make them bad and it certainly doesn’t make them mentally ill – and it certainly should not subject them, anyone, to therapies that we know don’t work and aren’t supported by science. Connecticut is the 9th state to ban the practice. Other states already banning what’s been called “ex-gay” therapy, “reparative therapy” and “conversion therapy” are: California, Vermont, Oregon, New Jersey, New Mexico, Nevada and Illinois; those states enacted laws, and New York banned it with an executive order by Gov. Andrew Cuomo. It’s also banned by three cities — Seattle, Miami Beach and Cincinnati —as well as Washington, D.C.
State Sen. Beth Bye told the Hartford Courant conversion therapy is a “very dangerous practice that has been repudiated’’ that “relies on shame and discrediting.’’ The practice can “have a big impact on minors’’ who are more likely to use drugs, suffer from depression and commit suicide “from not being accepted for who they are,’’ she told the paper. Critics of such bans, like Federalist op-ed writer Marcus Gregory — a gay man who claims to work as a scientist — cite debunked studies, discredited “experts” and falsely claim the bans result in preposterous treatments for children such as gender confirmation surgeries and hormone replacement therapy. So-called conversion therapy bans ironically prevent unhappy children caught in the trans contagion from accepting their natural bodies, and benefit an increasingly profitable gender clinic industry. They act as a Trojan horse for the transgender movement, who, almost unbelievably, are interested in vulnerable children as raw material to manufacture more transgender adults. Gregory also names transgender activists Autumn Sundeen, Dana Beyer and even Caitlyn Jenner to prove his transphobic points. “’Conversion’ bans on gender identity leave no mental health professional free to make her own decisions to help a child become more comfortable with his or her own body,” Gregory wrote. As in all of the other 7 states, Connecticut’s ban on conversion therapy will not interfere with mental health professionals treating children for gender dysphoria, other than to stop what the governor, lawmakers and advocates agree is “inappropriate” treatment for children.